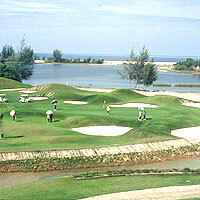 This one's for the "little guy" of Phuket golf - little known Thai Muang Beach Golf Course. Here, less really is less. Little has been written, advertised or spent on Thai Muang Beach Golf Course, and it's on the lesser-known Phangna Island of Phuket. Even lesser-known Perry Dye (Dye Designs) designed this course, but came up big with this exciting 18 hole par 72 sea-side layout on Thailand's Andaman Ocean. The more knowledgeable golfer who has played on true-links style courses will appreciate the hard-dry fairways and variety of different shots it allows you to play. Thai Muang Beach has a charm and atmosphere not found anywhere else in Thailand and if you're wanting a laid back golf experience on one of Thailand's more interesting and only true links style course, look no further than Thai Muang Beach. Many players are disappointed with the course conditions and think the course needs a major upgrade and while this may hold some truth, it would certainly be a shame if it were turned into one of the hundreds of green parkland type courses that are so prevalent in Asia.